The well-known charity Save the Children has teamed up with not-for-profit “Dismantle” in local youth enrichment programme called “BikeRescue”. 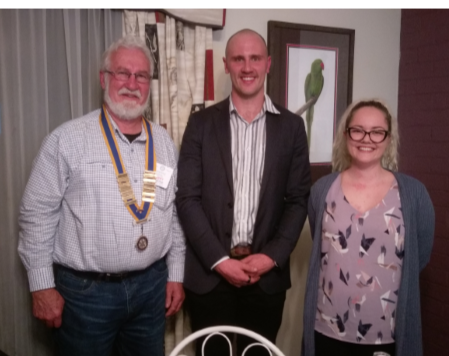 Save the Children’s Youth Engagement Team Leader, Samantha Dragon, and Dismantle’s Programmes Manager, Johno Montgomery, were guest speakers recently at the Rotary Club of Armadale. They outlined the concept of BikeRescue and how it’s designed to help at-risk local young people. BikeRescue is a dynamic youth development program that uses hands-on skill-building to engage and mentor young people in need of support. BikeRescue builds knowledge, social skills, confidence and teamwork through various mechanical and mentoring activities. During BikeRescue, participants fully strip and rebuild two bikes each. The first is donated to charity, which earns them the second one to customise and keep for themselves. During each session, BikeRescue mentors work alongside participants while exploring their mental health, hobbies, passions, and vocational aspirations. We help them to identify their barriers, figure out how to tackle their challenges, and provide support so they can reach their potential. BikeRescue is a partnership between Dismantle and Save The Children supported by an extensive partner network. These include various WA Government Departments, representatives from the corporate sector, Local Government, the education sector and various community groups. The programme is run out of donated space at Armadale Shopping City on Thursday afternoons between 3pm & 6pm. Dismantle runs various programmes that provide young people with enabling support so they can better manage life in a positive, self-directed way. BikeRescue uses bicycle mechanics activities and mentors young people to help them develop social skills, build confidence and connect to educational and vocational opportunities. Johno and Samantha told Rotarians at Tuesday evening’s meeting that the current Armadale programme has costs of $8,000, of which $6,000 is pledged by existing partners. They seeking a further $2,000 and have requested our club to consider meeting some or all of the shortfall. Rotarians are invited to drop in and see the programme in action—but it’s best to give notice of the intent to do so, to give the participants the heads-up, so they can be prepared for some “more senior folks” stopping by for a look at what they’re doing. Johno, who is an occupational therapist by profession, is married to Olive and he has been with Dismantle for three years. He has been on a bike since as far back as he can remember and he loves to tinker and build bicycles when he’s not working on a programme. Johno is a competitive Cyclocross racer and loves to be active as much as he can. Samantha, who is married to Jayden, started as a youth worker with Save the Children three and a half years ago. She also coordinates Ignite Basketball which was pioneered by The City of Armadale’s Jamie Barr, who was a recent recipient of a Pride of Workmanship Award from the Rotary Club of Armadale. Jamie has recently left the City of Armadale to work with Save the Children.